Creating a culture of citizen participation has never been easy. But now there is a greater need than ever for the activism of the empowered citizen. Ralph Nader describes the salacious satisfaction that can be derived when citizens roll up their sleeves and get involved in creating societal alternatives. In democratic societies such as Canada or the US, the quality of voting in an election is overwhelmingly determined by the quality of civic participation between elections. What voters do between elections determines the kind of issues, candidates, voter turnout and results that will occur at election time. If democracy is premised on citizen participation as the generic democratic force in a society, then citizens have to face up to certain consequential questions. Do citizens have enough rights under law? Do they have enough rights under custom - because we know we can have rights under law, but we don't exercise them - perhaps because of the oppressive custom of a particular community or a major corporation or a political machine in City Hall, any of which can cool people off and prevent them from exercising the rights they have under law. To what extent is the personal makeup of an individual an obstacle to exercising citizen rights? From our experience we know that in any community some people stand out and speak out; some people stay seated and are mute. Why? I believe that it starts with the personality of the individual. I would like to provide a few rough categories - we could all add many more - that are useful to open this line of inquiry. First, there are the people who would like to improve their community and who know what they would like to improve- whether it's the educational system, the functioning of City Hall, or the hazards of the drinking water. But they don't know how to go about it; or they don't understand the procedures and their rights under the law; or they don't know how to communicate to the media. They just don't know how to move forward because they never have, and never learned how to. Then there's a group of people who basically grow up without any civic sense whatsoever. They grow up thinking that they really don't matter, that nothing they do matters, and they silently sing their way through every day with the phrase "Que sera sera - whatever will be will be." So they turn inward on themselves, try to make some money, raise their family, enjoy their vacations and get through life in fairly good health, without a major disease or surgery . Then there's a category of people without even the sensitivity to feel that they don't count. Often, they are new to the country; they come from an authoritarian regime; they think freedom is defined as simply getting a good job and being able to pay one's bills - and that's plenty by their frame of reference compared to where they came from. These people have no understanding of the liberties they can exercise against their adversaries and oppressors other than to avoid them, run away from them, or dodge them. The idea of contributing to a community effort is considered as having a low rate of return, as very speculative, and as money down the drain. Then there are people who are active, who have achieved some success and have developed a tradition of skill, but they burn out after the first or second battle. They get tired, fatigued and weary of constantly having to exhort their neighbours and friends to join the effort. They burn out and sometimes never come back. They retreat into very private lives and live non-civically ever after. Finally, there are a very few people who are constant thorns in the side of the community establishment. I grew up in a small town in Connecticut where we had a town meeting form of government. I would be taken to these town meetings by my parents at a young age and I would watch the 200 people in the school auditorium sit there listening to the mayor and the selectmen as they were called at that time. There were always seven or eight citizens jumping up, challenging, criticizing the mayor and his associates, proposing new ways to tax more fairly, new ways to zone and new ways to use the town's money. The other people in the audience would have a double reaction. On the one hand they would say, "Terrific - we have someone who really knows the score." On the other hand they would have a queasy feeling - these people were a little too abrupt, a little too aggressive towards the elected officials of the community. The next day, the active citizens walking down the main street would be viewed as if they were mavericks – somehow deviants. There is the town fool, the town drunk, and the town citizen. There was no recognition that these citizens were holding up democracy for the rest of us. If anything, they were viewed as wavemakers, troublemakers and nasty curmudgeons. In some cases, they were ostracized to a point where they felt they had to leave town after major controversy, because their interpersonal relationships had been ruptured so badly. It is important to say what difference citizen participation makes. Certainly life goes on in Canada and the US, whether citizens are active or not. Certainly things can be worse; certainly civic perturbations can lead to disruptions and to breakdown of consensus and to unknowns. Certainly, things are worse in Bangladesh and Paraguay - so why be so upset? One professor from Cornell told me 20 years ago that as long as his liver was OK, he didn't feel that things were all that bad in the country. People who make statements like that usually have tenure. Their cheque comes every two weeks and doesn't bounce. Usually they have enough to feed their family, take nice vacations, live in nice homes, have two cars and send their kids off to colleges like Cornell. But there are other people in the country. There are in the United States 40 million very poor people, 37 million people without any health insurance whatsoever and 30 million people with very inadequate health insurance. One out of every five children lives in dire, poverty - we used to say "Asiatic-type poverty" but now we have to say "African-type poverty," given the rise of Asia. I'm not just speaking of homelessness. There are people in the US whose lives have been devastated by the addictions of a derelict society. One of the clearest, most serious signs of erosion in a democratic society is the lack of attention paid to major documented problems looming over the horizon. We are all too familiar with the long list. This suggests a very serious pattern of neglect, because citizens have neglected their government. Government neglects its society when citizens neglect their own government - when citizens let the government in Ottawa or Washington become a government of powerful special interests. The imbalance between citizen power and the power of special-interest groups has been growing dramatically in recent decades. We citizens have to address ourselves to redirecting the way we use our discretionary time. A shift in time design is at the bottom of any change in the course of human history. Millennia ago, people who were primarily hunters changed their time so as to become farmers, and then centuries later, they changed their time again to work in industry to earn money so they could go to the marketplace to buy the things they used to make for themselves. Today, with shorter working hours, people still say they have no time to be citizens. One reason for that is the 25 hours a week of discretionary time spent on the web and watching TV in North America. Another reason is the tremendous amount of time that automated kitchens, cars, lawnmowers, and computers, for example, take to repair and maintain. This is one reason why I have no car and very few modern appliances – it gives me more time to act as a citizen. Somehow, we have to make a significant shift so as to put maybe 10 percent of our time into civic activity, whether it's local, provincial, national or international. The history of the success of civic commitment is a good motivator. If we make a list of the major advances in democratic society from the right to vote, for example, all the way to the fruits of a democratic society, we will see that the initiative started almost always by one or a handful of citizens who decided to stand tall. Six women gathered in a farmhouse in upstate New York in the 1840s to begin the drive for the women's right to vote. One woman, Rosa Parks, refused to sit in the rear of the bus in Montgomery, Alabama, and started the civil rights movement. A few workers sat down in the auto plants in Michigan in the late 30s and launched the United Auto Workers. It happens time and time again. Why that does not give greater motivation to people who feel that nothing they do matters is still a mystery to me, because anything that has mattered has started outside of channels, outside of established institutions with protests and challenges by the citizens. Protest is nothing more than a short word for pro-testimony - an interesting observation to make when someone asks, "Why all this negative protesting". We will learn very little about the historical role of citizens from history books. In US history books you hear about wars, military skirmishes, elections and election campaigns. You hear of a few battles over hard money, soft money, silver and gold; then a little about the populist progressive revolt in the mid-western states. But on the whole there is very little written about the citizen movement. As a result, people grow up thinking that what they have has been given to them by some signal historic event like the American Constitutional Convention - which would never have occurred if some ordinary people hadn't started marching and protesting in 1776. We need to know the history of civic success not only as a motivational aid, but also as a learning aid - learning how it occurred, the elements of success, what the strategies and techniques were. Why would people be interested in civic action? In the first instance, not simply because it's an important subject. There are lots of subjects that are important that people aren't interested in. One reason is its possibility for personal fulfillment. It's no fun going through life feeling left out, feeling that you don't have a voice, that you don't matter and you don't count, that nothing you do will mean anything. Cumulatively, that kind of despair on a large scale results in a run-down society with its attendant poverty, brutality, disease, ignorance and illiteracy. These are cumulative effects of millions of citizen years spent in abdicating citizenship responsibilities. As I confront so much citizen inertia, the question I often ask myself is, "How can we make the seeking of justice personal?" There is a real hunger in society to learn how to become more effective as a citizen. People want to learn how to be whole human beings. They have seen the corrosive effect on their minds and consciousness of micro-specialization in what they do every day at their work or job. People want to be more complete human beings by integrating their value system with social activity. What they may not realize is that very real personal fulfillment can be found in citizen action - in clarifying our values as to what is just and what is unjust, throwing them into the marketplace of ideas, having them heard out and debated, perhaps having them accepted. Many people are unaware of the real sense of human fulfillment - and therefore human happiness - that is waiting to be tapped through civic involvement. Another reason why people would be interested is that it's a lot of fun talking about these subjects because when you make them concrete with specific examples, they either irritate you or they humour you. These topics are not abstractions; they are very concrete. You may be talking about civic review of boards of education when somebody says, "Yes I remember there was a school we tried to save, but it was destroyed because firms were making more money destroying schools and building new ones, and because the curriculum vitae of the superintendant of schools would look better if it said that the superintendant built a new school before moving on to the next high-paying job." Civic action is all connected with our regular experience as we live everyday in the community. Another reason why people would be interested in citizen involvement is that it's a socializing process - you find people who agree with you. Can you imagine what a pleasure that is to a lot of people? There aren't many places where you can discover that community of interest. You may meet with a lot of people at gatherings, but not over these kinds of shared community values. Take sports meetings, for example. You can go to baseball games 500 times, but you will never find out whether the person next to you shares your concerns over the drinking water wells in your community. Finally, there is the pleasure of the learning that happens when you get really involved in dealing with a sticky social issue. You get educated in a way that integrates many bits and pieces of knowledge. The traditional form of education tends to fracture knowledge, and while that's OK for vocational occupational training - at least in a very short-sighted way - it doesn't lead to wisdom or change for the better in a local cornmunity. For example, dealing with pollution in the neighbourhood brings in everything from esthetics to history, economics to administration, marketing to physics, engineering to public health. Dealing with that issue in depth becomes a compelling integrator because human problems are seamless webs - they don't simply come in the split format of academic courses, department by department in a college. If anyone wants to be trained in specific techniques of citizen engagement courses and manuals abound. You can fill 20 tables two feet deep with existing how-to manuals, advisories and specialized civic action strategies for every kind of societal issue. There are organizations already in existence working on many of the common social issues of today. 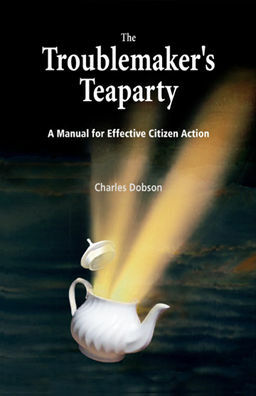 Some who have been through the fire of citizen action are willing to teach courses. The resources are there. We don't have to start from scratch. So what is missing? All that's necessary is the will to make it happen. Tradition backs us. The philosophy of government backs us. History endorses us. The need is apparent and everywhere we look the materials are available. What is the missing link? Where's the gap? The gap is the most important gap in human history. It's the gap between what you know should be done and doing it. The missing link is the capacity to go beyond a statement of affirmation which says: "Gee, what a great idea!" For too long we have been familiar with this pattern of response. Or, "Someone really needs to do something about this!" (That "someone" generally is someone other than ourselves.) All of history and responsibility for the coming generations requires that we bridge that gap. And when we do, a real sense of satisfaction and fulfilment goes with it. Ralph Nader is a household name standing for consumer protectionism and citizen involvement. A veteran citizen advocate, he looks much the same as he did nearly 30 years ago: a thin, almost gaunt figure who favours charcoal-grey suits, who never married, and who uses public transportation and doesn't own a car. Nader doesn't see himself retiring. "People of our generation want to retire from their jobs, but they don't want to retire - they want another career, another level of activity. For me, there is almost a constant level of activity. It's hard to conceive of retiring from citizen action and going into a patent lawyer's job." The movement seeded by Nader is heading toward citizen democracy - giving people some of the tools of democracy needed for the 21st century. In this article, Nader reminds us of the sense of fulfillment that comes with citizen involvement. From the magazine "Edges" published by the Canadian Institute of Cultural Affairs. Copyright: Canadian Association for Adult Education. Excerpted from Nader's address to the CAAE.